The Manhattan Project at Hanford Site describes the top-secret effort undertaken during World War II to develop a weapon never imagined at "Site W" or "Hanford Engineer Works," one of three sites selected in the United States (plus Los Alamos and Oak Ridge) to research and produce weapons that were ultimately used to bomb Hiroshima and Nagasaki and end World War II. It was a research and engineering feat of unimaginable proportion, and the total project cost for all three sites was $2.1 billion—an unthinkable amount for a country that was coming out of the Great Depression. It is a story of gumption, resolve, tenacity, patriotism, pride, and selflessness for the thousands of people who worked multiple shifts, seven days a week, in a hot, dry, and desolate desert, never knowing what they were working on. It is a tribute to American resolve in the face of overwhelming adversity. Author Elizabeth Toomey manages the REACH Museum in Richland, Washington, which was dedicated on July 5, 2014. 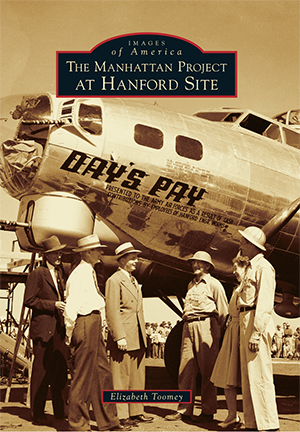 The Manhattan Project–Hanford Engineer Works story is a permanent exhibit. This book complements the REACH exhibit, providing greater depth on the story of Site W and the surrounding region's World War II efforts.